Summary: Matt Beaulieu was two years old the first time he held Elle McClure in his arms, seventeen when he first kissed her under a sky filled with shooting stars, and thirty-three when they wed. Now in their late thirties, the deeply devoted couple has everything—except the baby they've always wanted. 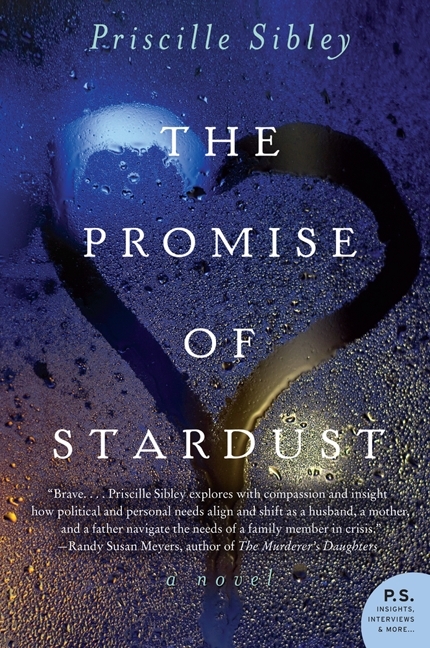 I rarely review books months before they are released, but I thought I'd make an exception for a very special book called THE PROMISE OF STARDUST by Priscille Sibley. Book Club Girl first mentioned this book to me over the summer, and she had nothing but great things to say about it. And then she described the premise of the book and I knew it had the potential to be good... really good. I couldn't wait to read it and was so glad when the ARC arrived on my doorstep! Despite my excitement, I waited until I had a day or two where I knew I'd have time to actually read the book the way it's meant to be read. For me, THE PROMISE OF STARDUST deserved to be read in as few sittings as possible. The main reason for that is because I knew I was going to get hooked and not want to put the book down; however, it ended up that there was another reason too. For much of the novel, THE PROMISE OF STARDUST deeply affected me. I cried over and over again and also felt sick in my stomach for the positions that all of the characters found themselves in. THE PROMISE OF STARDUST is one of those family dramas that manages to touch upon so many relevant issues. Here's a quick summary: Matt and Elle have been trying for years to have a baby. After battling infertility and miscarriages, Elle is finally pregnant but hasn't told her husband yet. When a horrific accident leaves Elle brain dead, a fairly obvious decision to take her off of life support becomes extremely complex when Matt discovers that Elle is pregnant. This dilemma about Elle's rights (and the unborn child's) pits family members against each other and shows that there are never easy answers when it comes to life and death decisions. I purposely gave you a very brief summary of the story. It is actually much more complex than that and truly delves into so many pertinent health and family issues in today's society. I admit that my initial impression of THE PROMISE OF STARDUST was that it was a major downer. I just kept asking myself, "How much heartache can one family take?" There were even times that I questioned if I could continue to read it, but those thoughts were quickly banished by my desire to see how things worked out. I'm sure you can tell based on the book's description and my impressions that it would make for a fantastic book club discussion. As I mentioned before, this novel delves into so many complex issues about life and death as well as patient rights and rights of the unborn. In addition, the book examines marriage, parent/child relationships, faith, grief, infertility, and much more! I was fortunate enough to be part of an on-line discussion with Ms. Sibley just a few weeks ago, and I have to say that I appreciated the book even more after hearing her talk about it. Ms. Sibley is a neonatal intensive care nurse who deals with life and death situations on a regular basis. She's had an inside look at how these decisions affect families, and I have a feeling that her characters reflect much of what she's seen. I loved THE PROMISE OF STARDUST and I have a feeling that it's going to be a popular book club selection for 2013! Highly recommended for fans of family dramas as well as Jodi Picoult, Barbara Delinsky, and Kristin Hannah fans. Even your review is devastating! I don't think I could read this one, even though it sounds really good! This sounds like a good book. Thanks for the review. This book is sad, but so good! It really makes you think and count your blessings. I'm like you, I appreciated it more after the online discussion.